This is the biggest upgrade to date with many new features and controls. Control Centre 6 started slow down with use and became slow to operate and also cumbersome to update, so it has become necessary to rethink how Control Centre 7 moved forward. CC6 had 470 actions inside if I followed the same principle then CC7 would have almost 900 actions today, therefore it would be slow and almost impossible to update without causing issues and bugs. So Control Centre 7 has 120 actions so it will be at the very least 4 x faster. With this in mind I feel that something unique needed to happen to this complete ground up rebuild. Rebuilding Control Centre 6 needed to be reduced in size which has lead to a fully automated set of “Modules” being built. It is faster than before and much more adaptable for the future but just as user friendly and familiar as before. And each one will stay inside its shortcut until you want to return to CC7. Similar to Control Centre Systems and Shortcut Hub, this lead to a radical approach and a away forward in rebuilding the new Modules. However everything you had before is still here, it just works faster. All are separate modules , shortcuts which totally act as one shortcut seamlessly everything starts with Control Centre 7, with the familiar menu structure of CC6, having discovered a unique way of moving from one shortcut to another, that I have not seen in any other shortcut, you would think that you are using just one shortcut. Speed between switching is faster than previous methods I have used. And you can move inside the module you are using until you want or need to go back to CC7. Next I would like to introduce Control Centre Address Database, what, why and How. What is it, it is simply a Dictionary where you can store any address you want here. Why, well I found myself writing the same information over and over again, that’s no longer the case, write it once and once only. Also if you upgraded the shortcut with it built in previously you lose anything you have done, going forward there will be no need to upgrade it, therefore be safe in the knowledge you only need to write the data once. And it can be used in many Shortcuts going forward when others follow this way of building shortcuts. How, by calling this data in my shortcuts you can quickly get map data / locations fast the bonus is it’s seamless operation and quick too. If you travel a lot you can reorganise the Dictionary so your places you want to visit are at the top of the list. As a demonstration it is pre-filled with lots of address around the world to give you an idea how it works, you can replace these as you like. When updating them make sure they are TEXT based. Used mostly in Travel for now but there are options planned further ahead. Get help quickly in Emergency, where am I?,Park my Car, Take me home, Regular Places I visit, Directions to next Event, Share Location, Find local Business (directions), Find Local Business (Phone Number and call direct from the shortcut), Use Public Transport, Airplane Mode, Travel Planning, Timezones. Get a fully daily weather report for any capital city, for today, tomorrow, day after tomorrow and any day looking up to ten days forward. In addition, click on My location or get an address from the Addresses database. A fully operational Music system where you can adjust the Volume, change tracks back and forth, create a new playlist and a lot more. Anything that is a system control, is adjusted here, Volume, Brightness, Wi-Fi, Bluetooth, DND, back up shortcuts and share them and a lot more. So let’s say you have a routine of your own that fit’s better for you, why not just rename it to the same as one from me then it will perform as part of Control Centre 7, or you can simply run it from Shortcuts on the CC7 menu or any other shortcut you have in your library. 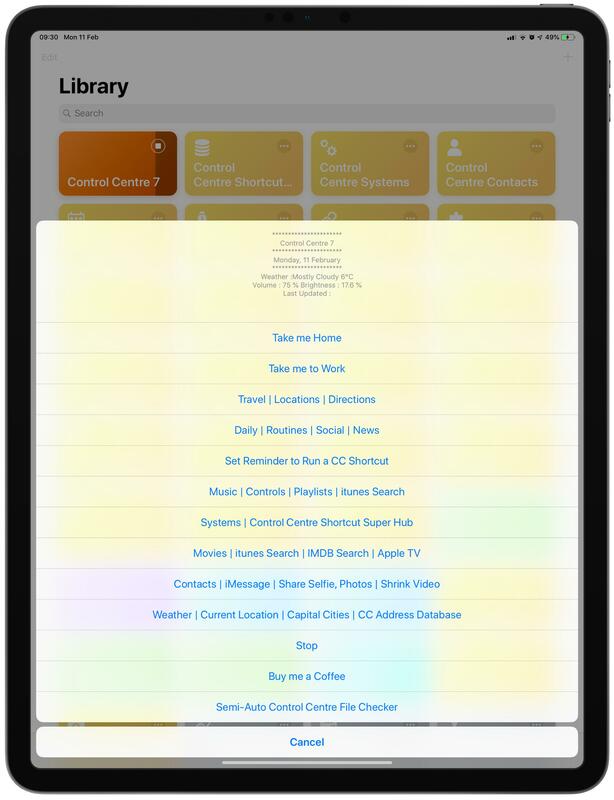 Allows you to build your own Control Centre with shortcuts you already have in your library. Why don’t I support update type kits, simple answer is speed. Why have I split up my Control Centre , again speed and being able to update it much easier. what’s the point of the Address Database, if it was contained inside a shortcut, such as travel and I update it, you lose all the work you put into the addresses. Now you don’t, as I will not need to be updated by me again. if you had not split it how big would it be now, around 900 actions is now split across all the Modules. Allows you to schedule when to run a shortcut at a later time by using the Apple reminders app and the above new module, so run a shortcut at a given time and day, at arriving at a location or leaving. Also need CC address database and new cc links which is a pass though shortcut, which I’m developing for other uses to.